Using the RPR-33PS will save you space and money by eliminating the need to use two or three isolation relays to get the job done. 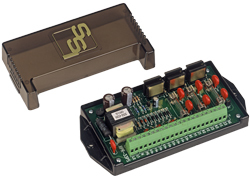 Rugged construction, wide power supply range, heavy duty optically coupled Solid State switching devices, and the standard large footprint modular enclosure are just a few of the features this versatile relay from SSI provides. In addition, the RPR-33PS has several optional configurations available: 125VDC or 15-48VDC power supply input voltages (a separate power supply for recorder applications that provides a wetting voltage for use with telemetry equipment that does not supply a wetting voltage).